Karla has been waiting so patiently to see these pictures, I'm sure! 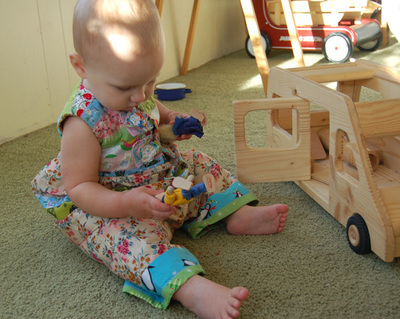 We received this lovely outfit during my blog break several weeks ago, from Miss Pinky. I didn't know what she was sending me, so it was such a surprise! 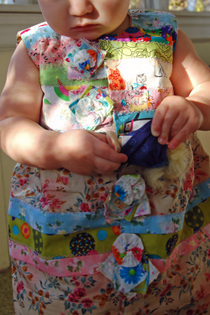 She said she was inspired by Lyn's scrap patchwork (that I adore as well) to make this outfit for Adelaide. It's so thoughtfully made in so very many ways - the 'buttons' that are made just for picking, pulling and playing with; and the cozy, soft flannel lining on the inside to keep her warm. She posted a few more photos of the outfit on her blog here. 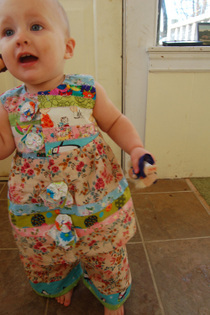 I'm so touched at the amount of time that went into this sweet outfit and so grateful it was shared with us! Thank you so very much, Karla!